Ero knew, at that very moment, what was missing. It struck him like lightning. His captain had put it in him, by his life and example. He had learned something of it too from the Funnemarks. It finally took Stuart Hawkins, the green-sleeved poet of the Greenback-stealing City of Thieves, to put his long green finger on it--the cross! It was the very means, the road, the bridge, to the Golden Fleece. He didn't have to put it in words, he just knew it! And the one Pathfinder who was a shepherd, and who knew intimately of faith and the cross? There was only one in the group with all those credentials who could express it to thousands with authorithy and eloquence. "Representative Gameplayer must answer. What is his choice--one, two, three, four, or five?" Four bells sounded. You are to be congratulated, Representative! You chose the right Pathfinder and Questor holding all the critical coordinates for a successful venture. That does not mean you will succeed, but you can now challenge the worst that your opponents can throw at you as you compete for the Golden Fleece. Bon Voyage! CP unit will now terminate." A moment later, Ero was back on the ship, standing exactly where he had been when he last stood there. A shout went up, and the men rushed at him. Excitedly, they grabbed his arms and all wanted him to tell them what had happened. What had he decided for them?" The captain sat down, pipe in hand, not sure he could take the news standing up. Ero smiled at him. "Captain, and fellow comrades, we are going on with the Quest! And we have a Questor, a special Pathfinder, who will help us and guide us. He is not here with us, but his image will be. We are to put it up on the mainsail. It will not matter how strange it may look to us at first, it will inspire us. We can go through any difficulty if we just look at it. Raised up on the mast, it will even cure us, if we just look at it--no matter if we are dying! You'll see! I have already seen him and learned about his life--this man who clings to the Cross. I can tell you more too." Even as he was speaking the mainsail, which was unfurled, began to glow, and an image of the Pathfinder was etched on it. But something else appeared--a Cross!" The men, who just minutes before had been at their lowest ebb, totally discouraged, looked at the man, then at the cross, and something everything changed. They became strong again. They believed again that what they were seeking would be worth the pain and struggle and also help him bear the losses they had just suffered. It was almost as good as being dead and then being brought back to life! But Ero must have been cookied. 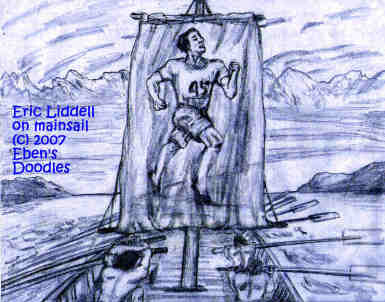 The glitch that had occurred previously had followed him, bumping Pathfinder David Wilkerson and replacing him with the missing Eric Liddell template (for this was no mere jpg-image). As they set out once gain, it was this Pathfinder that glowed on the mainsail, inspiring them to exert themselves to the utmost to put on a last burst of speed in the remaining seconds of the great race of their virtual lives. Something very different from this was happening on the Anti-Argo, the Black Ship, of course, yet a bit of the Black Ship had somehow crept onboard the White Ship and found soil in Pieter in which to germinate and grow. He was feeling very resentful. His Dutch pride was still wounded by what the Captain had done--taking the helm away from him temporarily, and then correcting him in front of all the others. He couldn't forgive the captain for that. It made him mad to think about it, and he thought about it increasingly. It caused him to question the captain's leadership too. Why was Captain Pikkard always playing the mouse to Captain Wolvewoeld's cat? What was gained by such Jack Dutch cowardice? Any Dutchman worth his Delft salt shaker would have hoisted his fists and squared off with his opponent by now! 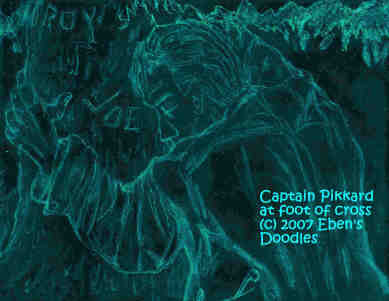 But Captain Pikkard was always pulling his punches instead, turning the other cheek! And this policy had cost them dearly, had it not? They had lost half the crew! He has also lost all his closest friends--as close as anybody could get to a Dutchman, that is, who expected them to be as flawless as he knew himself to be! Pieter had been given his rudder oars back, but it was not the same as before they had been taken away. He still felt shamed and humiliated, and a desire for vengeance was beginning to grow almost out of control. What could he do to change things for the better? he wondered. How could he get the Captain to see Dutch sense? How could he persuade him to go on the offensive, and break out the cannon, instead of always sticking to a defensive position, taking whatever the enemy had to throw at them and then running with their tails between their legs? The helmsman was not happy, to put it mildly. And a frustrated, resentful, vengeful Dutchman is a most dangerous thing to have onboard a seagoing vessel. You never know when all control will be lost, and...KABOOM! It's like a ton of dynamite goes off--and deck planking, and keel timbers, and oars with oarsmen still attached to them, all go flying, along with the mast and sail--in all directions! It is not a question of if it will happen. It is just when will it happen? To look at Pieter, however, he looked a bit more withdrawn than usual, and a bit green around the gills, but other than that, there was no sign of any imminent eruption. 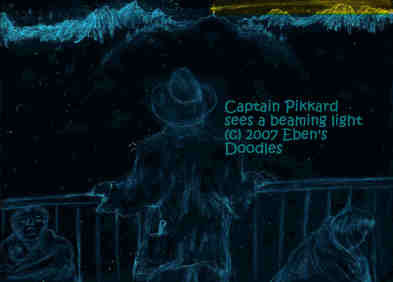 But Captain Pikkard had the whole crew to think about, not just Pieter. For their sake he gave orders for them to stop at an island with the highest elevation. Soon they found what he was looking for, and they were anchored. It didn't take them long to climb up the only peak on the island, which was about a thousand feet high, tall enough for what Captain Pikkard had in mind. He called the Cybernauts together, and then explained what they could do with this wooded height. "Here is our opportunity to make a fitting memorial to our lost comrades. They deserve something that will stand for a long time, and be a beacon for ships that may pass this way. Find the tallest tree in this grove, one that is straight and true, and remove the limbs and bark and all the fir boughs, and then prepare a cross beam from another tree. We will not have to uproot the trunk. Let it stand, rooted as it is. It will not move, that way, and it will take the storms better, than if we use a detached wooden pole. All right! It is time to go to work. The other trees, we can also use, for the area around the memorial, which is a cross, must be cleared if the memorial is to be visible far away. We can use the trees you cut for building a small cabin, in case people want a place to lodge while they make the climb up here and back. It will be a sort of guesthouse. The men set to work. It didn't take away their grief entirely, but it did put it from their minds. They even forgot, temporarily, the great danger they were in with such reduced numbers. 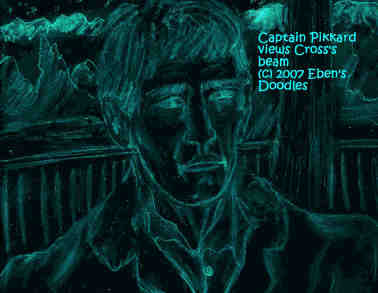 When the cross was finished and the names of their lost comrades etched on it all around and far up the main beam, Captain Pikkard went and stood at the base with the men sitting down, resting, all around him. He thought he would dedicate the cross-memorial, but did not get very far, before he found he could not go on. As for the Cybernauts, they were in no better shape, even after the therapeutic work of making the cross and clearing off the peak all its trees and brush. The whole ceremony he had meticulously planned collapsed, as he found himself too overcome by his emotions to make any sense with his tongue. Fortunately, Ero saw his good captain's plight and stepped to the bat. 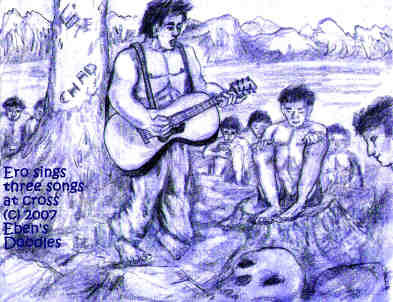 He had his guitar, and he was thinking that he might sing Stuart Hawkins' song a second time. But instead of it different words came, and his fingers also strummed a different melody. It was there by faith I received my sight, and now I am heppy all the day." Very surprised, Ero was about to set the guitar aside and sit down but then another song came, even more urgently than the first. "Beneath the Cross of Jesus, I fain would take my stand. The shadow of a mighty Rock, within a weary land! The astonished men rose and came forward, full of questions. Just before he had begun singing, they all been discouraged, feeling their grief return, and even terrible fears were assaulting them as they imagined what the Black Ship, with its full crew, could now do to them. Now that was all changing. The two songs, despite the bewilderment they brought, made a real difference in their outlook. The future no longer appeared so bleak. They could look out now from this windy, island peak and see a glimmering of something that promised life not death to them. "Yes," one spoke for the rest. "I am a sinful man--but what can I do about it? I could never really change myself, despite all my good resolutions! What I want to know, Ero, is how I can rid myself of my sin and shame and find this glory you sang about, this glory that is in the Cross. What is it? How can I find it?" Ero, wondering what to say, tried to explain. "I didn't know those songs before I sang them! Please believe me! They just popped into my mouth and my fingers! No, I don't know what the Cross means! Perhaps the Captain can explain the Cross, for he ordered it to be built." The moment he said this yet another song came to Ero. It was so powerful he was forced to sing and play it. Three songs about the Cross, explaining it to them--as far as it could be explained and they could understand at the time. But, nice and encouraging as they were, it would take more than songs to get them safely to their destination. Ero was aware of this fact even while he was singing--that the three songs of the Cross were just part of their new array of weaponry. They would have to use all their weapons--including the Pathfinder logo on the mainsail--if they were to reach their destiny successfully. Captain Pikkard, whose mind was running along the same lines as Ero, reflected, moreover, that the old, traditional weapons had failed them. They were sure to lose with them, as well as without them. Their opponents were counting on their relying on them as they had in the past. He did a strange thing which astonished the men. "We are going to proceed by faith--yes, faith! I want you to throw all your swords and shields overboard! They wouldn't have saved us anyway, as you know by now. As for the cannon, our opponents have proven that they can outshoot us anytime they want. Why they haven't finished us off completely, I have no idea, except maybe the cat is playing with the mouse. At any rate, we're going forward--as far as we can--by faith. Any questions? The men, all except Pieter realizing they had nothing to save by holding on to their weapons, threw them overboard. As for Pieter, he slipped a sword under the floorboards, when he thought no one was looking. "Just in case the captain is wrong about this!" he thought, smiling. "At least I won't die like a toothless, old dog, with no way to defend myself! The others can play the fool if they want, but good Dutchmen like myself know how to be prepared if the sea breaks through the dyke!" The men, before they departed, built the little guesthouse at the at the foot of the island's mountain. Water from a brook was at hand nearby. There was two bunks, with some bedding from the ship that had been washed and dried. It was simple, bare of luxury, but the aroma of the clean wood was refreshing. 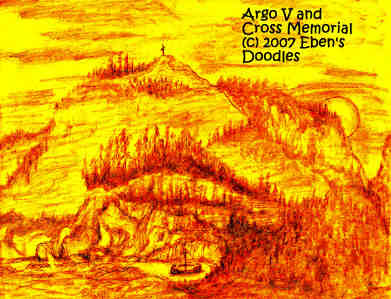 Their last day was a beautiful one, with the sky full of evening sunset color, a splendor of red and gold that touched and transformed everything, from the towering cross on the mountain memorial to the Argo V nestled in its little harbor far below. Gradually, all the glorious colors faded, and it turned dark and the stars shone, and the cross melted into the darkness. While the men slept like ditch diggers who had well earned their slumbers, Captain Pikkard sat up as the first watchman of the night. Something started flashing high on the mountain top of the island. He stared at it, his eyes hardly believing the sight. 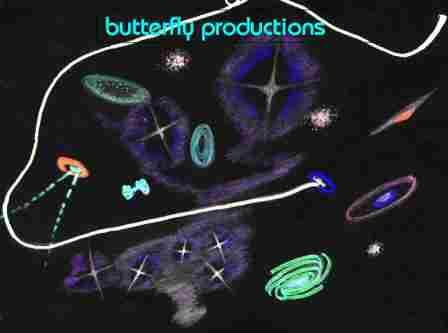 It flashed in a circle, again and again, its beam shooting far out across the Sound, north, then east, then south, then west, and around again. Captain Pikkard was astounded as he gazed at it. He remembered his words to the Cybernauts about their building a cross that would serve as a "beacon" to seafarers--and there it was: a true beacon shining from the top of the cross memorial! As he watched it, he began wondering what it could possibly mean. How it was powered, he had no idea. It was nothing but a tree trunk and a crossbeam, that was all he knew for certain. But there it was--a powerful lighthouse beam piercing the darkness on all sides. Was it a sign of something to happen soon to them? They were headed to Trial Island at daybreak. Was this given them to encourage them somehow? What encouragement was it then? Would they have to wait until they reached Trial Island and met whatever dangers and tests they might find here? Someone tapped the captain on the shoulder, and he spun around, fully expecting a pirate swinging a scimitar at his head! But it was Pieter, a bit groggy eyed, come to relieve him at his post for the second watch. Captain Pikkard almost sank to his knees in relief, but remembered the cross. "Look, Pieter, that light--"
Even as he raised his hand to point to the Cross's beam, he saw there was no beam--it was completely dark on the mountain top! "Yes, Meinheer? What is it?" Captain Pikkard could not believe there was no sign of the beacon. It had been so bright and powerful a moment before. Why had it gone so suddenly? He tried to tell the helmsman. "I saw a light, like a beacon, shining from the cross memorial--" he began. But he realized even as he started, that Pieter wouldn't understand a word, and would wonder if he were losing his mind from all the stress they had been through lately. "I'll tell you later maybe. Well, carry on, helmsman!" he blurted out, and left Pieter scratching his good, thick Dutch head. Captain Pikkard stumbled too many times to count as he climbed. When he finally reached the summit, he collapsed, gasping for air, his arms clutching the cross at its base. All the things that were churning inside him came out here, at the foot of the cross. He prayed, as if he were thinking out the agony inside him. They had come to an end of what they were--and they really could not match their opponents' strategy and superior knowledge of the course. They had suffered terribly for it--losing so many fine Argonauts it was painful to think how many. Each one was a loss that could not be made up, even if someone else took the place of the one lost. The fellowship of the Argo had suffered a shipwreck, and though they were given a new ship, they had no real chance of avoiding the fate of seeing themselves and their ship destroyed before they ever reached their goal! The thought of what was coming made the captain groan and cling all the harder to the cross. The cross was somehow comforting, because it was something he could grasp, while it seemed to meet his pain with a pain of its own. Did it not have the names of his lost Argonauts on it? Perhaps that was the pain that he felt throbbing beneath his fingers. Now they were at the the crossroads, he felt, where hard realities needed to be faced and hard decisions needed to be made. What could he tell the men that would give them hope with which to go on? Could he tell them the truth? He had no such hope to offer--that was the truth! All he could offer was more pain--and loss--and deaths. The ship--that was doomed for certain. In hours, when they set out, they might meet with the Black Ship and be blown out of the water once again. Yet this cross--it was a strange thing! It had come alive in the night, when everything had grown so dark, shining like a lighthouse beacon! Then, just as suddenly, it had stopped shining, and the darkness had come back to overwhelm them. But yet...he remembered the light. The darkness and despair that engulfed him could not wipe out the light he remembered and the fact it had appeared. He could not explain it on either count. But the fact of it stood firm, just as this cross memorial under his hands. In a few hours they would have to leave this safe haven and go to meet whatever was awaiting them. Would they ever reach Trial Island? As for the City of Victory, where he thought the Golden Fleece must be hidden somewhere--that seemed unobtainable and forever out of reach. Yet they had come this far--and they had no choice but to go on. To turn back now was unthinkable! They might as well run up a white flat on the mast and surrender as slaves to the Black Ship! That captain of theirs would probably make them kneel while his men took turns beheading them--for he looked he looked like he was capable of such deeds. No, he would rather fight on--despite the odds stacked against them. As the captain was thinking these thoughts, a strange peace fell upon him. His tangled thoughts cleared, and a single phrase came into his mind: "Fellowship of the Cross." What? he thought. What was a "Fellowship of the Cross"? He paused to think about it, as as he considered again their prospects, it seemed a line had been drawn in the sand--over which they could not return--and it meant one thing more too: they were not to continue as they had been, they needed to change and take on a new kind of brotherhood, to enter into a kind of covenant with each other. No longer would they be mariners on a quest, but something new: knights of a fellowship, something like the Knights of the Round Table headed by King Arthur once upon a time, far in the past. 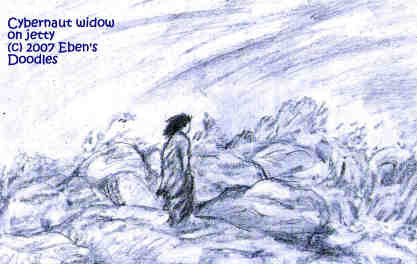 This new fellowship would be centered on the cross which they had made on the mountain top. The cross would give them the strength they needed to complete their quest. This idea grew all the stronger and brighter as he thought about it. Yes, he decided. This was the change they all needed. He would put it to all the men, in council, in the morning, before they set out. Let them decide whether to join or not. It might make all the difference. It seemed to offer a real way for them to deal with the difficulties and struggles ahead--and whatever losses might assault them too. They needed what this fellowship would give them--since the former association had come to a dead end with the loss of so many of their comrades and the despair and hopelessness that had seized them as a result. Captain Pikkard's frantic praying was over. His clutching at the cross relaxed, and he lay there simply absorbing the strength he could feel coursing back into his body, heart, and soul. "Meinheer, what on earth are you doing up there?" The voice made the captain spring to his feet, totally amazed. "Pieter?" he cried. "You're supposed to be on watch! What are YOU doing here?" Pieter explained, in familiar terms, as if he were humoring an old man or a very young child. "But Meinheer, my watch is over. I am on my own time now. I saw you gone for my entire watch, so I came to find out what happened to you. Was that wrong of me to do?" Captain Pikkard was ashamed at his reaction. "No, no!" he said, clapping a hand on his helmsman's strong shoulder. The captain felt a bit old, though, at the moment. He sat down to get his thoughts together, as they had been before the unexpected intrusion. Should he tell the helmsman now what he had been thinking? No, he decided. It was best to wait, and then give it to the whole council. He rose. "Well, Pieter, let's go. I had my little rest here, and we need to get down to the ship to see that it is seaworthy. But we'll have breakfast, of course, before we sail. How does that sound to you?" The sky was lightening, with a glimmer of light before the sun appeared over the mountains in the east, as the captain and his helmsman left the magnificent cross on the summit of the island and climbed back down the steep slopes to rejoin the others. How much easier and faster it was to descend the mountain, and how slow and hard was the ascent. In what seemed like a few moments, they reached the ship, and already heads were bobbing as some of the men awoke yawning and stretching their arms, rising to roll up their blankets, stash them away under the center floorboards, and get ready for the new day's sailing. When the breakfast was over, the men content, they held the council, and the captain first explained what he had in mind about the Fellowship of the Cross. It was an amazing, new idea to them--but each man, by talking it over, gained understanding as he heard the others and then asked questions too that could be answered by others better than himself alone. In this way they all came to an agreement, that the Fellowship was a good thing for them to join. It was unanimous, except that Pieter, unable to express his own doubts and misgivings, kept his own counsel and went along with the others. With the Fellowship established, the voyage took on a new dimension, like quantum algebra is a new dimension above ordinary algebra, so much so that there are only six men on earth who are able to understand it. Everything they did from this point on was charged with a new, different meaning. They began thinking of others more than themselves--though they had not been entirely selfish before this time, only this was now a central focus for each of them. It was others who mattered most--not themselves and their individual wants and prospects. Captain Pikkard could see this sea change almost immediately in the way the ship's business proceeded--there was no argument and bickering or complaining. Everything went more smoothly. Only Pieter seemed a little out of step with the changes--though he smiled more often than formerly. The captain intended to return to the wives some of them had left--only now they were widows, every one of them! It was a sad message they would be bringing to the women on the island in the north. What could he say to comfort them? he wondered. Unknown to the captain, the women had been watching every day, all faithful to their Cybernaut sailors. One even went down on the jetty, in the worst winter storms, to catch the first sight of the incoming ship. The Fellowship of the Cross was inaugurated! It seemed so appropriate, with the Olympic gold winner on the mainsail as their banner to encourage them to press on toward the prize and the stature of true champions. Strangely, the weather turned cross the moment they had agreed to form the Fellowship. A gale blew in, dragging the ship ashore, chain and all. Fortunately, the shore was not full of jagged rocks as most of the shorelines were. 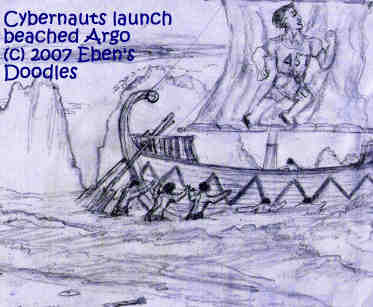 The sand could do little damage, and the wind and waves were the hardest thing for the ship to bear as they lashed and beat at the beached Argo. Yet the gale quickly blew itself out, and the men just as quickly launched the ship, to get it out of harm's way should another storm blow in. They were safest in the deeper waters, and so the captain gave orders and they were soon on their way to the island of the widows. They had no just gotten their second wind and were swiftly on their way when a popup and its warning buzz drew their attention. "Perimeters of the Quest Game have been compromised. There can be no Fellowship of the Cross. Questors must return to perimeters or the Game will be terminated. Game will be terminated in three minutes. Press spacebar once if you wish to continue with the permimeters and finish. Press spacebar twice if you wish to terminate." If the Cybernauts had been holding their oars, they would have dropped them. This was astounding news to them. A look of dismay crept over the whole group, and the face of the captain was ashen. Three minutes to decide? Only three minutes? Of course, Captain Pikkard knew they all wanted to continue the Quest, and finish, with the Golden Fleece their prize firmly in their hands--that was certain! But what could they do, if they had somehow, unwittingly, violated the "perimeters" of the Game? How could that rule be overturned? What could they say to render it null and void? It seemed impossible to think of anything in a few minutes space of time that would do that. The captain sank to his knees, then sat down completely, as everyone stared at him, completely forgetting the ship as it continued on its way north toward the climax of their Quest, Trial Island. Pieter dropped his steering oars, letting the ship go wherever it would go, and leaped into the midst of the dismayed Cybernauts. He gestured at the captain. "Just like I figured, he's no proper leader for us! He got us in this fix, and now he can't think of a way out! Well, I know what exactly to do! Do you want to hear it? Do you?" The Cybernauts, reeling with the thought they might be terminated in mere two and a half minutes, were open to anything he might say that could possibly help them escape a dire situation. 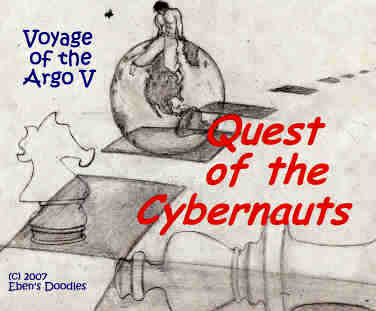 Ero thrust out his hand, as if to grab Pieter and shake him over the side of the ship, but Captain Pikkard barked, "No! Let him speak!" Ero stood down, but he still looked like he might make a move on the Dutchman, but again the captain shook his head, commanding, "Let him alone!" Throwing out his chest, giving himself a punch with his thumb, Pieter shouted, "We're either men or boys! Which is it? I say forget the Fellowship of the Cross right this minute, and go on with the Quest as we started it! It's insane to be terminated now, when we're all so close to the golden prize, the glory and the fame!" He continued, throwing out his chest and washboard abs another notch. "Nothing can stop us, if we want the prize enough! Why be sidetracked by a silly, jackdutch Fellowship of the Cross--whoever heard of such a thing anyway? I once thought Pikkard knew what life was all about, but he don't! You seen what a mess he has made of this whole Quest up to now! We can change it back the way it should be--without him too! I'm no quitter! Quick! Let's make the only decision that real men can make--give up his crazy Fellowship, make me your captain, and go on! I got a hunch we can make a deal with the Black Ship--they are men of reason like us. We can all share the Prize together--and quit fighting for it! When we get the Prize, with their help, we can then take them by surprise and eliminate them. Isn't that smart? They'll fall for it! They'd never guess we would try something like that, not with this captain! Remember--the end justifies the means! Nice guys finish last! Now--we can't waste any more time." As if he were making the decisions now, as if he already were captain in charge, Pieter stepped to the popup to press the spacebar. The next few moments were utterly confused. Ero leaped, throwing himself with all his might at Pieter. The ship itself was out of control, veering sharply right, rudderless. With a sudden lurch and wrench to the extreme left, the main sail slammed to the waterline at one end, catching in the waves, which spun it around. The contents of the ship were suddeny airborne. Everyone was ducking the flying ropes and sail and scattered oars, and then there was a tremendous sound as the mast split, cut completely in two, with pieces flying and the sail toppling over onto the ship. Captain Pikkard could not see what was happening, as bodies were thrown this way and that to struggle in the sail. He could not see that Pieter had hold of the popup with one hand, while he was pressing the spacebar with the other. He had to do something to stop Pieter from continuing the Quest! He threw himself forward, hoping to reach the popup and the mutineer before Ero could make Greek shish kebab out of him. Retrostar Challengers must choose one among these events they think most probably happened after the traitor, Pieter, pressed the spacebar.